RJ Power Group is a specialist electrical group providing engineering solutions in the power sector. We take great pride in providing outstanding quality to our clients through an open and honest approach, which has led to the establishment of many long lasting relationships. We have three complementary businesses that meet and exceeding our customers’ requirements in respect of the design, installation, testing and commissioning of both high and low voltage power applications in the UK. Our rail credentials stretch back to 2008. We now provide power engineering services for the rail industry as a Principal Contractor. Our expert team has decades of experience covering all aspects of electrical engineering within high voltage electrification systems, traction power and industrial low voltage distribution systems across various regions within the UK. We offer a full design and construct service, with safety and efficiency at the very core of our business. We have secured both framework and standalone contracts to renew and maintain high voltage, traction power and low voltage distribution assets throughout the UK, and have a proven track record. We always aim to complete our works whilst minimising disruption to our clients network – delivering a comprehensive and managed service free of disruption. RJ Power Rail shares our clients’ objectives in how we conduct ourselves and our business, which has allowed us to develop long-term relationships with Network Rail, TFL as well as several Tier 1 contractors. RJ Power Networks undertakes all manner of installation works, from control cabling and relay works, through to the provision of high voltage ring-main systems and private distribution networks. This includes the initial supply and subsequent installation of all high and low voltage switchgear, transformers, cabling and earthing. Upon completion of all installation works, we also undertake all necessary commission testing prior to re-energising. As specialists in designing and installing electrical networks, RJ Power Networks offers extensive experience to private network customers looking to expand, modify or renew their private HV network. RJ Power Networks offer a bespoke service for every client. They are capable of modifying or expanding an existing HV network or building a new private HV network, and provide a fully managed service for each and every commission. 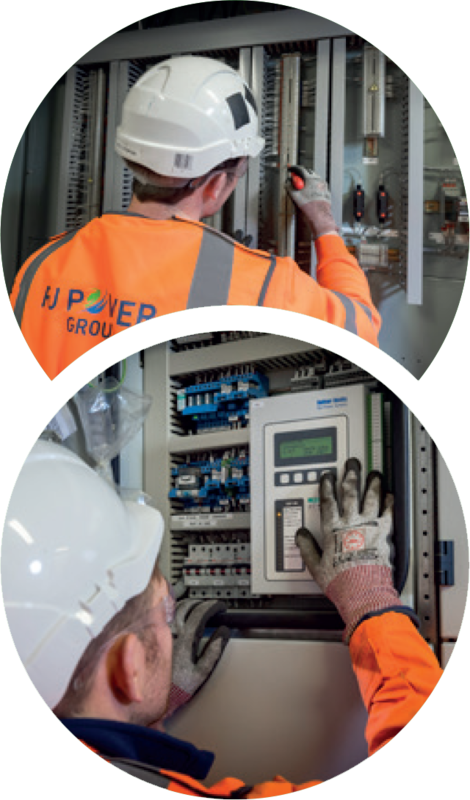 RJ Power Connections is a NERS certified Independent Connections Provider (ICP), experienced in delivering safe, sustainable and cost-effective grid connections to electricity distribution systems. We are fully approved to undertake contestable work and offer a quicker and highly cost effective alternative to the DNO. RJ Power Connections can provide a fully managed service; offering a bespoke solution covering everything from the application process, design, into construction and commissioning, through to final project adoption and full energisation. A highly skilled in house engineering team delivers the entire scope of our service. We always aim to deliver a professional, responsive and constructable solution that meets the project timeframe and exceeds expectations.